Each convention appearance announcement brings with it a number of email inquiries regarding convention sketching and signing etc. It’s not possible to answer everyone personally so I've set up this Convention FAQ page which should(?) answer most of the questions that come my way. If your questions aren't answered here, shoot me an email and I'll try to get back to you before the Con that you've inquired about. (1) Are you taking commission requests prior to the convention? No. Just not enough time at home for commission requests of any kind. Not likely to change any time soon, especially given my travel schedule. (2) Are you bringing any original art to the show? A recent pre-con sketch with additional Copic Grey marker shading. Prices vary but typically a bit above the convention sketch price. Not likely. If you mean original comic pages, definitely not. All pages or covers created for Marvel, DC, or other publishers are long gone! On rare occasions I might be able to bring a few "pre-con" sketches. Those are head/shoulders type sketches and typically with additional Copic Grey marker shading. (3) Which days/hours will you be signing? (4) Are you sketching at conventions? I try to. On a "time permitting" basis though. If the signature line is steady throughout the weekend, I typically only get to a few and on a couple of occasions "none"! Finished sketches are head and shoulders type sketches. If I do more than that, it just takes to long and I'd rather get a sketch into the hands of as many people as possible. When John Beatty is appearing at the same show, we do "Zeck/Beatty combo" sketches with my pencils and his inks. We can get sketches into the hands of more people that way, they look great, and the sketch price remains the same (see question 6). Zeck (pencils) and Beatty (inks) sample convention sketch. (5) Will you add me to your sketch list now? No, too difficult to plan ahead and pretend to know how much available time I might have for sketching. From past experience, there is not enough time at any given show to honor all requests. Best advice I can give is catch me early if possible... and keep hope alive. (6) How much do you charge for autographs and sketches? FREE on any item purchased at my table. $5 for comics and other items brought to my table. $15 for comics and items that are to be graded by CGC, by CBCS, or other graded/witnessed items. *Note that I also bring COAs (Certificates of Authenticity) which can be added to any signature for an additional $3. Starting at $60 (above the price of the signature) for small "remarque" style sketches on comics. 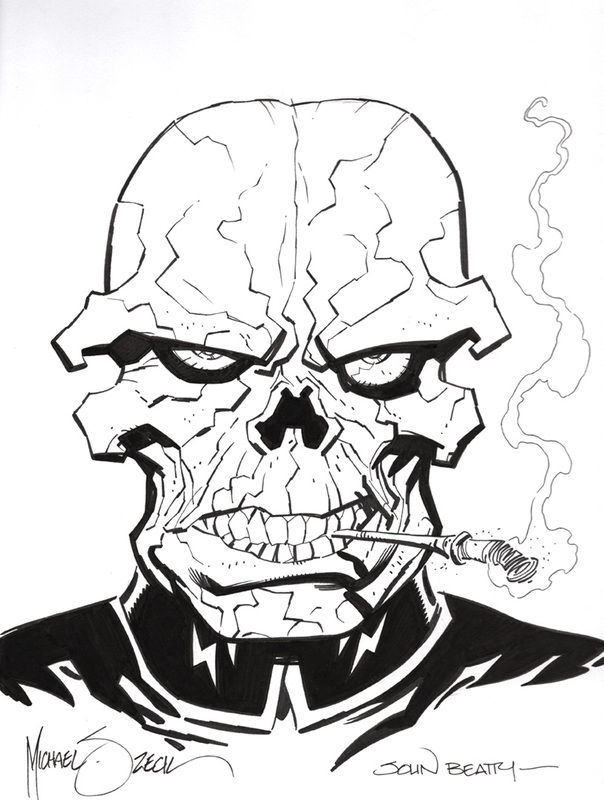 $350 for finished/inked head and shoulders sketches. And in instances when it might be a smaller head sketch as part of a "jam" piece, it may fall somewhere in between. (7) Do you limit the number of books you will sign? No. I may let some folks with just a couple of books jump in for signatures in order to keep a long line from forming. Be patient, and I will sign all items you bring to the show. (8) Do you charge for photos? No. Even if you don't have anything for me to sign, stop by the table to at least say "Hey", shake hands, and grab a photo op if you like. It'll be my pleasure. (9) Will you have prints of your work? Yes, 11 X 17, "press quality", UV coated, prints on 120lb card stock. Starting at $20 and quickly dropping to only $10 each. Starting at only $10 for folks who have already paid for a signature or purchased something else at the table. If you're planning to be at a convention, you can preview the prints over at my SHOP page. Every print I make available at shows is also available to purchase through the site for those folks who don't get out to conventions. *At almost every show I'll have toploaders (11 X 17 hard plastic protective sleeves) available at $5 each so your prints can arrive home undamaged. When available, I also bring some variant covers to shows, and sometimes other comics or books depending upon what I have that particular weekend. (10) Can I interview you for my Podcast, blog, publication, or ??? No. A combination of lack of time here, and especially at conventions, coupled with a lack of interest in that type of thing.